In 1985, Joseph Eckendorf jumped into the pool and completed the first event of his first ever Quad Games. He completed all of the Quad events that year alongside his girlfriend, Kate. They both had a love for fitness and competing in local fitness events. Their love for each other grew with each bike ride, swim, run and ski they did together and they got married in 1989. In 1991, Josh Eckendorf was born and he inherited the same love for fitness and competing in local athletic events. Joe and Kate now had a super fan, who cheered for them at every local race. Josh had heard countless stories about the Quad Games and couldn’t wait until the day he would “grow up” and be able to compete. A few miles away, Bill Morosky was living a similar story. 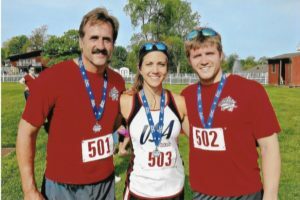 Between studying to be a dentist, building his local practice, sponsoring local races, winning countless swimming titles, and welcoming his daughter Lauren into the world, he too had become a prominent figure in the athletic world in Erie. Lauren soon became his super fan, following him to all his events, cheering for her dad and dreaming of the day she would “grow up” and be able to compete in the Quad Games herself. It’s a good thing he suffered through the long run because a few years later, Josh and Lauren got married and are now familiar faces at many of the local races, including the Highmark Quad Games! Their childhood dreams of “growing up” and being able to compete in the Quad has come true! If you ever have a chance to talk to Lauren and Josh, you will soon find their enthusiasm contagious and you better be careful or they will have you signed up for the next Highmark Quad event before the conversation is over. Their family found this out quickly. When I announced Joe Eckendorf’s names at the last Highmark Quad Swim, I knew Josh and Lauren had something to do with him coming out of a 33 year hiatus and taking on the 36th Annual Highmark Quad Games! Joe said that a few things have changed about the Quad Games. Gone is the hill on the Peak ‘n Peak ski course, the mass start at the Quad bike, local legends such as Steve Blair, Dave Utley and Grant Koehler are all names that come up when stories of past Quad Greats are told and now locals talk about the young athletes who are living up to these past Greats – Dan Peirce, Pam McCormick, Matt McWillams, Andrew Holland, Nancy Herbst and Desiree Terella are a new generation of Quad Greats that locals will be talking about for many years to come. On the other hand, he said a lot has stayed the same. Before each ski, every Quad participant is praying for snow, the 100 yard swim still feels a lot longer, the Quad Kids lets those little Josh and Laurens compete with their parents at each event, and the Highmark Quad is still a fun, family friendly event that motivates hundreds of athletes to stay active all year long. The Highmark Quad Games has remained an event that anyone can participate in and fall in love with! Joe said that his son and daughter-in-law’s enthusiasm for the Highmark Quad Games was contagious and he sees a lot of his (and his wife’s) younger selves in them. Both Lauren and Josh grew up going to the Edinboro Triathlon and various Quad Games events, seeing how families can come together and enjoy a fun filled day together, whether competing or being a spectator. The Eckendorf’s and Morosky’s have been a part of the Highmark Quad Games since the beginning and I think we can expect to see them participate for many years to come. Running, swimming, biking and skiing runs through their veins. They have even decided to take it to the next level by becoming the newest race directors of the Edinboro Triathlon. Keep your eyes and ears peeled for the name Eckendorf because I think we will be hearing more and more of it in the upcoming years. A big thank you to Joe and Kate Eckendorf and Bill Morosky for taking the chance on a crazy event called the Quad Games over 30 years ago and motivating their kids to fall in love with it. These are the peopled that have helped keep the Highmark Quad Games going strong after 36 years. We hope to see YOU at our 36th Quad Bike event on Saturday, July 14, 2018 at Edinboro University. We challenge you to be the next Eckendorf/Morosky story.